Speech Tracker - Listens to the microphone for a loud sound and then calls the Google Offline Speech Recognizer to turn speech into text. Movement Tracker - Examines the sensors in the phone and AndroidWear watch for a recognizable movement (eg. roll of the wrist in one direction and back again). Command/Tag Manager - Commands describe the apps (along with any parameters) that should be targeted for when triggered by specific speech or movement. You can make commands active when you wan to use them and leave them inactive the rest of the time. Only the active commands can be triggered. The manager allows creation, editing, import and export of commands and tags. Trigger/Command Matcher - When a speech segment is turned into text, or a movement is recognized by the movement tracker, the matcher looks through all the currently active commands for those that specify the same trigger in the command. Command Dispatcher - Once matching command(s) have been found, the dispatcher cycles through them and sends each command to it&apos;s target app as an Android Intent. If the command specifies a built-in action (like taking a photo), the action is carried out by FlickStart directly rather than passing an Android Intent to another app. Built-in Action Processor - A number of actions have been built-in to FlickStart because FlickStart needs to be able to do actions even while the screen on the phone or watch is off and many apps are not designed to operate in the background. 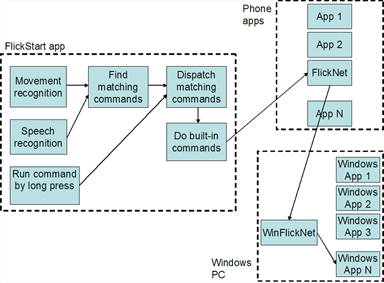 From the diagram you can see that it&apos;s possible to initiate a FlickStart command either from speech, a movement of the phone, or by doing a long press on a command (commands can be displayed from the 'TAGS' tab). 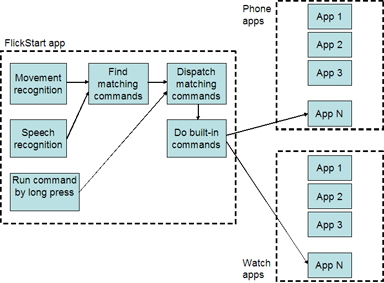 The diagram suggests actions are all initiated from the phone, but you can also start commands from a connected Androidwear watch by a movement, tapping on a command, or even via an Android intent send by another app. Examples of speech triggered commands that drive phone apps can be seen here, while motion triggered equivalents are here. The initiating mechanisms are identical to using FlickStart on its own. The difference is that commands destined for a PC app first target the FlickNet app on the phone. The FlickNet app picks up the parameters from the Android Intent and delivers them to the WinFlickNet app on the PC which then interprets the parameters and applies them to the target PC app. Examples of speech triggered commands that drive PC apps can be seen here, while motion triggered equivalents are here. A command relates a speech segment or a type of movement to an operation to be done on an app. For instance a command can be created to link a roll of the phone to a set of parameters which make an app called "Tell Me The Time" speak the current time. Commands which share a common theme can be grouped into 'tag's. For instance commands to operate a music player in different ways (pause, previous track, next track, etc.) might be grouped into a tag called "Music Player Control". To take the "Music Player Control" example a bit further, if you have a watch as well as a phone you might want to have a set of commands which control the music player from the watch and another set which control the music player from the phone (eg. "Music Player Control (Handheld)" and "Music Player Control (Wearable)". By convention tags made from commands that use a speech-based trigger end in "(Speech)". You won&apos;t want to have FlickStart monitoring speech and movements all the time. Even when you want monitoring to be on, you will sometimes want your movements to apply to one app and at other times to another app. For instance you might want moovement based music player control only when you are in the car. FlickStart lets you turn the monitoring on and off through the 'MOVEMENT' tab. When you want to swap from controling one app to another app, FlickStart provides a mechanism to select tags (on the 'TAGS' tab) and make the selected tags active or inactive. A speech segment or motion can only trigger a command if the matching sensor button is on AND the command is part of an active tag. However, you can start a command by a long press even when the sensor is off and the tag containing the command is not active.